It's 1948 and the Cold War has reached Chile. In congress, Senator (and renowned poet) Pablo Neruda (Luis Gnecco) accuses the government of betraying the Communist Party and is swiftly impeached by the president. Police Prefect Oscar Peluchonneau (Gael Garcia Bernal) is assigned to arrest the poet. Neruda tries to flee the country with his wife, the painter Delia del Carril, but they are forced into hiding, where Neruda writes his epic collection of poems, "Canto General". In Europe, the legend of the poet hounded by the policeman grows, and artists led by Pablo Picasso clamor for Neruda's freedom. 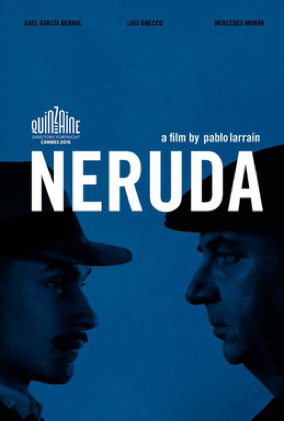 Neruda sees this struggle with his nemesis Peluchonneau as an opportunity to reinvent himself and sets about playing games with the inspector, leaving clues designed to make their conflict more dangerous and more intimate. In this story of a persecuted poet and his implacable adversary, Neruda recognizes his own heroic possibilities: a chance to become both a symbol for liberty and a literary legend. Pablo Larrain was born in Santiago, Chile. He is a founding partner of Fabula, a production company dedicated to film, television, advertising, and production services. In 2005, Larrain directed his first feature, "Fuga". He then directed "Tony Manero", which premiered at the Directors' Fortnight of the 2008 Cannes Film Festival. "Post Mortem" is his third feature. It premiered in Official Competition at the Venice Film Festival in 2010. In 2010, he directed "Profugos", HBO's first-ever series produced in Chile. The following year, Larrain directed "No, which also premiered at the Directors' Fortnight of the Cannes Film Festival and was nominated for an Academy Award for Best Foreign Language Film. "The Club" premiered in Official Competition at the 2015 Berlin International Film Festival, where it was won the Grand Jury Prize Silver Bear; it was also a nominee at the Golden Globes for Best Foreign Language Film. Neruda is his sixth feature. In 2016, Larrain also directed his first English-speaking film, "Jackie", starring Natalie Portman.